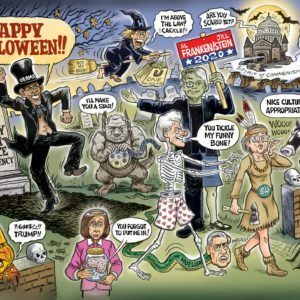 The scary people featured in my latest Halloween cartoon all have a fondness for socialism and globalism. They’ve promoted violence and even murder in order to help bring it about. Obama is a monster who claimed his administration was ‘scandal free.’ His line was instantly parroted by the fake news media. Barry’s presidency was packed with scandals and he got away with all of them. The legacy media watchdog didn’t expose those scandals because they are aligned with the left. They all want socialism and open borders globalism. For a good book that exposes Obama’s scandals, read “The Scandalous Presidency of Barack Obama,” by Matt Margolis. George Soros has funded the so-called ‘caravan’ coming up from Mexico. They are his personal army of invaders. The miserable old billionaire thinks he can bring about the UN rule of America. He must not be allowed to succeed. He is the most dangerous monster right now, so I made him the largest. 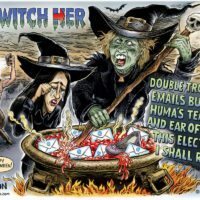 Crooked Hillary, fueled by her ill-gotten gains from the pay-to-play Clinton Foundation, is a cackling witch who will run for president yet again in order to help her avoid a prison cell. She can’t be allowed to get away with it. Lock her up! Eric Holder and Debbie Wasserman Schultz both got away with crimes. Seth Rich was murdered, for one thing. Holder’s ‘Fast and Furious’ operation, designed to bring about gun control, resulted in 200 deaths in Mexico and a dead border guard here in America. Former CIA chief, John Brennan, said Trump was a ’traitor.’ He offered no proof, because there is no proof, but we have proof that HE is the traitor. After all, he once voted for a communist. He and Obama are on the same page. Fortunately, President Trump removed Brennan’s security clearance. 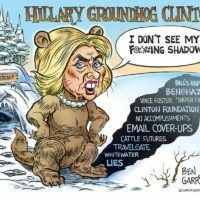 Hillary’s security clearance expired and was not renewed. Traitors don’t deserve such access. 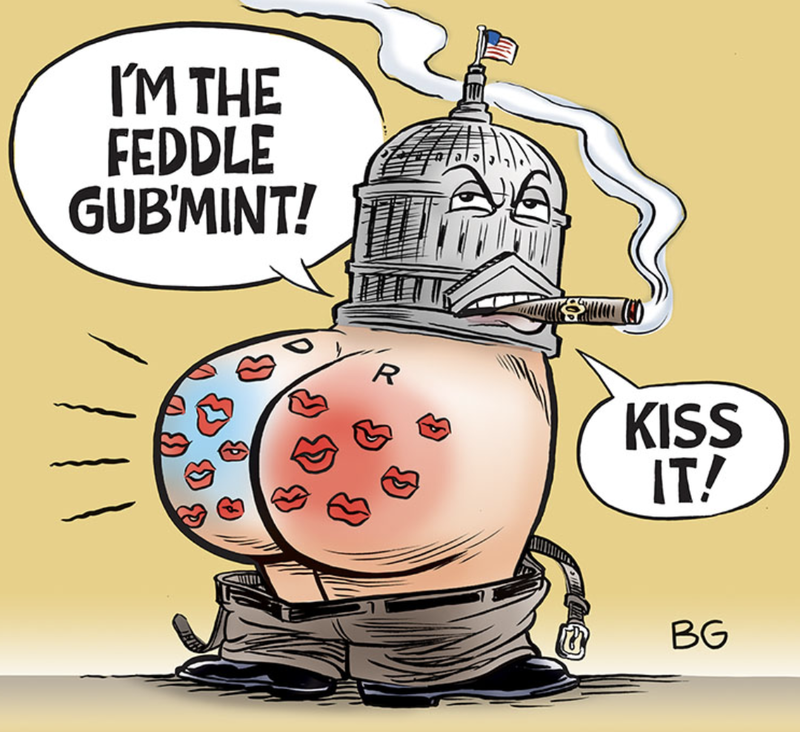 Aiding and abetting the ‘Democratic Socialists’ are the traitorous social media. They’ve aligned themselves with the totalitarian Chinese and against the American people. 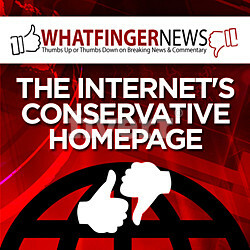 They do not believe in the First Amendment and are now blatantly deleting or shadow banning patriotic conservative Americans. They too want socialism and globalist authoritarianism. These people do not deserve to be treated with anything except our contempt. There are a lot of other scary figures I could have added, but this cartoon is horrific enough as is. Happy Halloween from Tina and Ben! 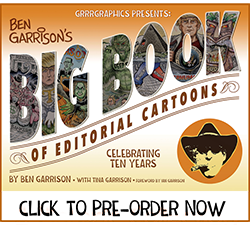 THE GARRISON is now Live – Join Ben at Cartoon Headquarters! Click to watch Ben’s invitation to you! 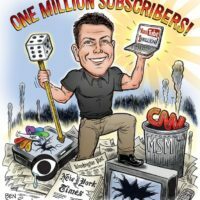 See you at THE GARRISON- an online Community for MAGA Patriots! 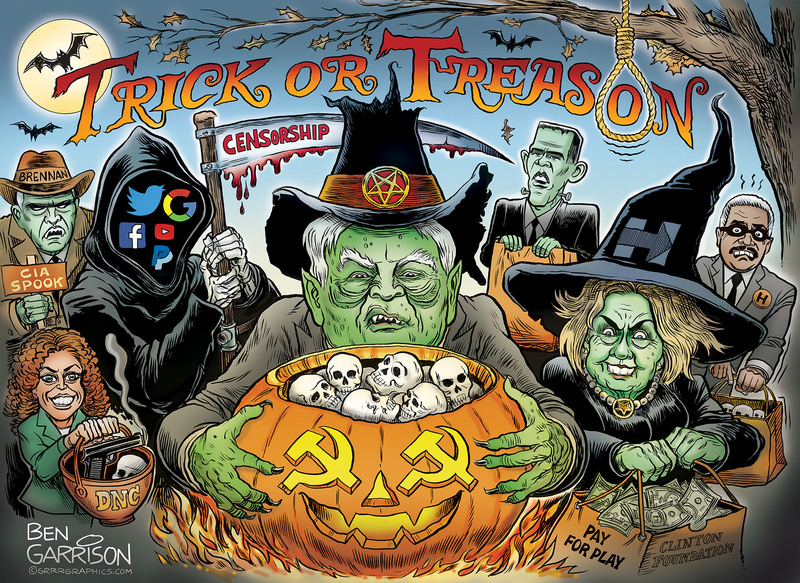 The Garrison, is the GrrrGraphics online community for patriots willing to fight the tyranny of the radical American-hating Left and their enablers, the Mainstream Media. Together we are strong, don’t let them divide us! 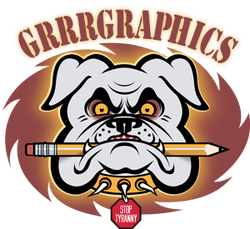 Join Ben and Tina at Cartoon Headquarters, The Garrison, an online forum and community for MAGA Patriots like you! 14 Day Free Trial, Cancel Anytime- Start your Membership today!